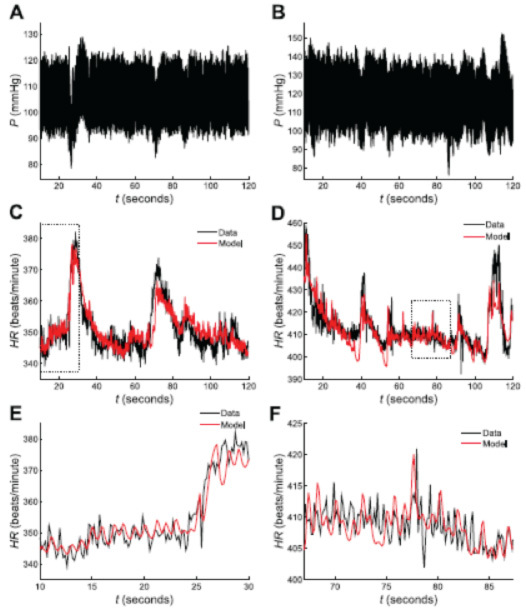 We present a phenomenological ODE model of baroreflex open-loop control of heart rate. We present a phenomenological ODE model of baroreflex open-loop control of heart rate. The signal flow of the model is diagrammed in Figure 1. An aortic blood pressure signal (the driving signal for the model) is transduced by afferent baroreceptor nerve fibers in the wall of the aortic arch into a neural (firing rate) signal. This transduction process is governed by mechanical strain in the wall of the aorta. This neural signal is then relayed and further processed by the central and peripheral nervous systems into parallel sympathetic and parasympathetic tone signals. Sympathetic and parasympathetic tones drive release of norepinephrine and acetylcholine, respectively, into the neuromuscular junction of the sinoatrial node of the heart, thereby modulating the pacemaker activity at the sinoatrial node. The sinoatrial node is the ultimate effector of heart rate, which is the model output. Example fits of overall baroreflex model to heart rate data. The model of the overall baroreflex control of heart rate is able to simulate the major features of the heart rate data derived from Dahl SS and SS.13BN rat strains on low-salt diets. A, B: aortic blood pressure (P) 2-min time series data served as the input to the model. Data shown in A and B are from the SS and SS.13BN strains, respectively. Heart rate data of C and D were derived from the pulse pressure data of A and B, respectively. Optimal fits of our overall baroreflex model (red) to the heart rate data (black) demonstrate the ability of the model to capture many important features of the data including both the large slow peaks and the beat-wise oscillations. E, F: model fits of C and D are scaled to show 20-s segments where the model is able to reproduce beat-wise oscillations particularly well. Segments of data (black) and model fits (red) shown in E and F correspond to the boxes drawn in C and D, respectively.